I remember reading somewhere that we should plant the garden of our lives with the beautiful flowers of friendship. 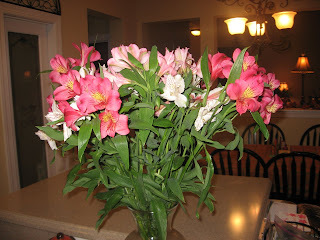 This bouquet reminds me of the gift of friendship and how important it has been during the past several months. The first day after we got home, Lysa and Hope came by with a big pot of Chicken Tortilla soup, Redneck surprise for dessert, along with lots of love and kisses! Holly brought us that beautiful bouquet of pink flowers above and her sweet smile. 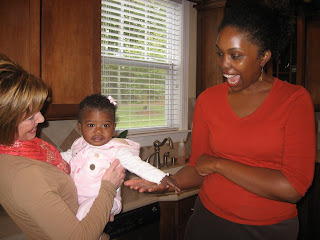 We had such a fun time visiting and getting Aster to giggle! She things Aunt Lysa is pretty funny! 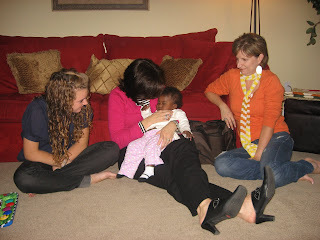 It was so sweet to see Hope holding Aster again after being the first one to hold our baby girl in Ethiopia the week after we had gotten our referral for Aster. Holly and Aster playing acrobats. She loves to fall backwards. 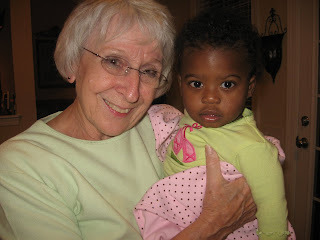 My mom came by that night after work to meet Aster for the first time. Aster met her cousins Alex and Sara who came to visit the next weekend. 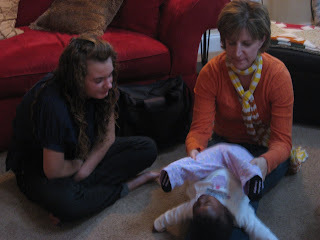 Sara loved playing with her new baby cousin! 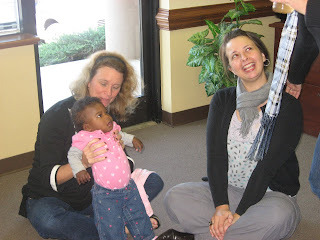 Last week we made our first visit to the Proverbs 31 office. 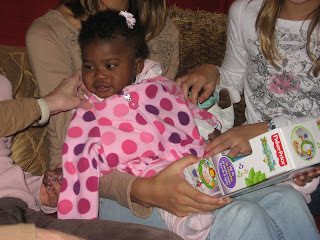 Here are Wendy Pope and Teri Bucholtz lovin' on my sweet girl who is wearing her princess outfit that Micca gave to her. Can you see the crowns on her shirt and jeans? Wendy's daughter Blair and Aster bonded immediately! Ahh, isn't that the sweetest photo of two beautiful princesses? Melissa Taylor and my girl! 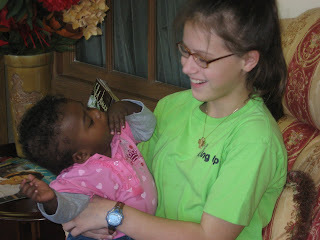 Tracie Miles holding the little girl she'd been praying for for months! Sweet Samantha just couldn't seem to get Teri to let her have a turn. I guess we'll have to go back again and have more play time in the P31 lobby. Last night I was thinking about how all of my friends (including you!) and my beautiful flowers have really helped me the past two weeks. Both have brought encouragement, joy and laughter to the hard places of this new transition. It's been more thank wonderful to have Aster home but I'd be living in denial if I didn't admit it has been hard to get used to all the changes and balance all the needs. Yet in the midst of trash cans overflowing with dirty diapers, crusty babyfood stuck to me and my counter tops, rice cereal flakes scattered across the kitchen, emails and calls unanswered, toys and laundry everywhere, days without a shower and sleepless nights - my beautiful bouquet of flowers has sat in the center of my kitchen and each day it catches my attention and brightens my outlook. And just like those flowers, God has also provided friends who have prayed, sent notes, brought meals, left comments on Facebook or my blog and stopped by to meet Aster and keep me company. 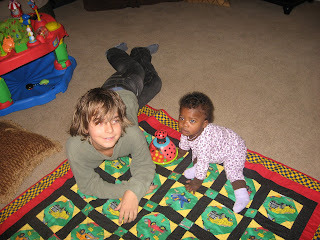 Both have helped me find peace in the chaos and joy in the clutter. So today I'm thanking God for the friendships and the flowers He's provided to brighten my life's garden these days. My wonderful girlfriends Sharon, Bev, Alli, Erin and Erika (all from my Bible study group at church) hosted a big homecoming/baby shower for Aster at our house this past Saturday. We were lavished with love and gifts, but the best gift of all was having so many friends stop by to meet Aster and celebrate our precious little girl with us! My friends Heather and Sharon, and Sharon's daughter Morgan, made this beautiful banner with sparkles and all to welcome us home at the airport last weekend. 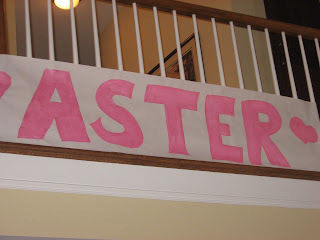 I just had to save it, so we decided to hang it up over our living room for the party. It's so pretty! I'm not sure when I'll take it down..maybe Christmas! This is the first bow I put in her hair. She looked so special and pretty that day. 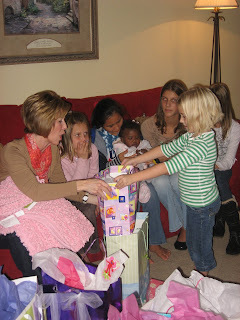 The whole time I opened gifts, I was surrounded by sweet girls who also served as personal assistants. That is Alli and Erika to the right and then Pa Saw to the left. 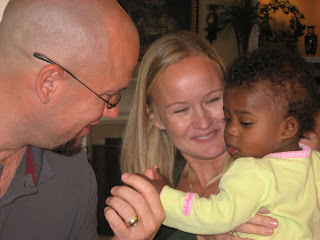 Pa Saw is Melissa and Mark's adopted daughter (also in this photo with their baby girl Marissa). Pa Saw and her sister Moo Nay (in the photo above this one) are Karen refugees from Thailand. That is Aster's big-girl cousin, Sara! She drove in with her mom from Raleigh. 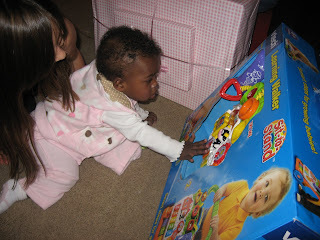 She loved helping Aster discover her new lights and music learning walker. I love how Aster is leaning over to see and listen to me. 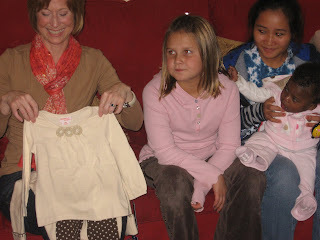 Isnt' that the cutest little outfit I am holding from my friend Jennifer! My friend Alli's friend Laura, who I met an a nail salon, gave Aster her kid's almost new soft plush rocking snail. It is adorable! Thank you Laura. Us girls in the kitchen chattin' it up! That's my beautiful friend Erika. 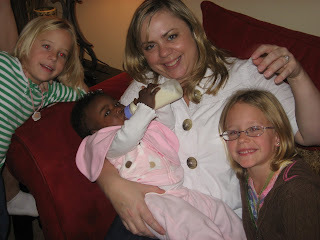 My sweet friend Erin feeding Aster with two sweety pies nearby, Madeline and Emma. Here are Madeline and Emma's dad and mom, Jason and Sharon Epperly. 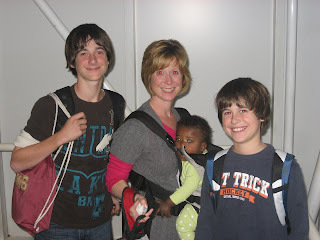 They brought home their little boy, Jonas, from the Ukraine last February. Ahh, I love this one. What a cutie pie in that pink hat. I could eat that little fluff of cotton candy! Micca Campbell, my surprise! She and her husband, Pat, drove 7.5 hours all the way from Nashville, TN for the party. She just had to meet Aster before she got too big to hold and snuggle. I was so happy to see her! My very sneaky sweet friend, LeAnn Rice, coordinated the surprise! Here she is with Micca in Aster's room. 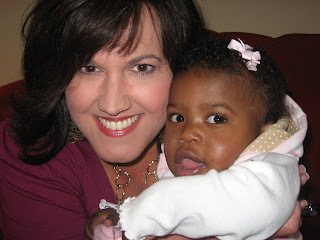 Aster's Room ~God's sweet gift to me and my little girl! 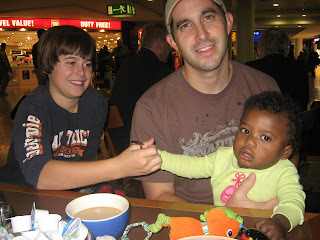 When we started our adoption process two years ago we prayed long and hard about moving. We loved our old house but we needed room from more. Right when the market was crashing God sold our house in 21 days and led us to this one. When we found the house we now live in (which was a model home), it was completely decorated with a beautiful princess room. Even the window treatments were here! 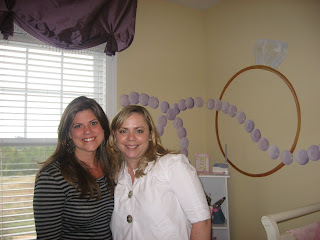 My friend Pam loaned me that beautiful crib that looks like it was made for this room. All I added was the pink princess fluff! What says girly more than pearls and diamond rings!? 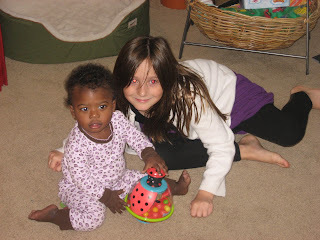 Here are my my sweet sisters-in-Christ, Megan and Erin, who happen to also be sisters with each other! As I showed Aster's room to my friends, I shared with them how we are going stencil one of my favorite verses inside that diamond ring above the bed. It's going to say ~ "You will be a crown of splendor in the Lord's hand, a royal diadem in the hand of your God. 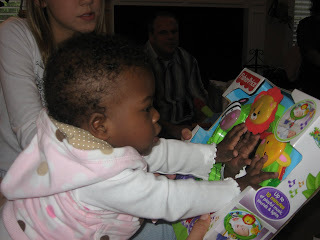 Isaiah 62:3"
My friend Jodi is giving me the gift of painting Aster's dresser to match the crib. Won't that be so pretty? I love, love, love this room. Sometimes I just go up there and lay on one of the beds and pretend I'm the princess! 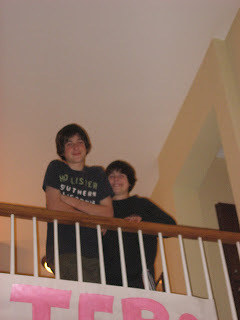 My sweet guys were a little overwhelmed with all the girl-ness going on downstairs. But we caught them watching and enjoying it all from a distance. 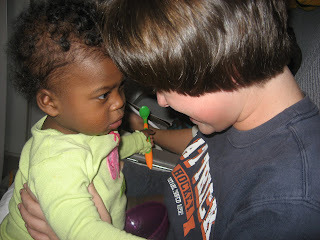 They are such great big brothers!! Hi bloggy friends! I miss you! I have so much to tell you about our first week at home with Aster. I posted some updates on Twitter and shared some photos on Facebook last week. Hopefully you (my bloggy friends) have seen some of those in my new sidebar Twitter scroll gadget. That seems to be the new best way to stay connected between posts. I knew having a baby would take a lot of time, but boy I don't think you can ever prepare for the kind of time it really takes. It's all so worth it and I love every minute I have with her. I just wish I could do ALL that I want to do. My goal is to get photos and updates posted before I go to bed tonight. 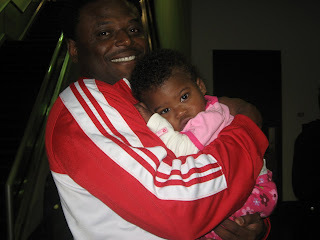 While you wait for me to come back you can hop here to Micca's blog to see some cute photos and read about her surprise visit to Charlotte to meet Aster at our Welcome Home Baby shower/party this past weekend. Coming soon...more photos and memories! 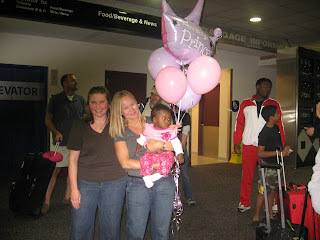 Thank you so much for praying for our family as we traveled to bring our adopted baby girl home from Ethiopia! 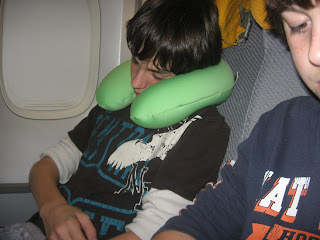 It was a very long trip and we are completely exhausted, but we're doing really well! It honestly could not have gone any better. 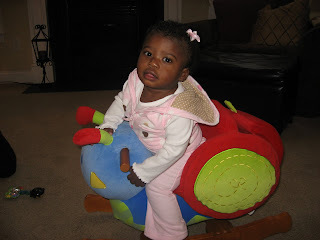 Aster was an amazing little traveler! 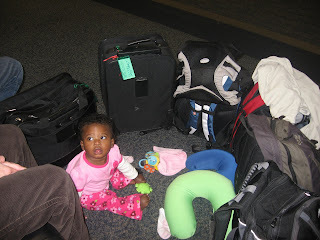 Aster loved the airport with all the people, lights and sounds she'd never experienced. 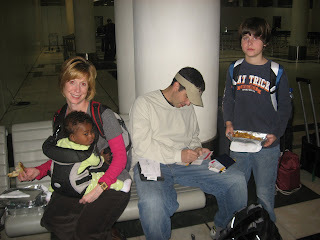 Here we are filling out customs paperwork and eating dinner at midnight before we get on the plane. 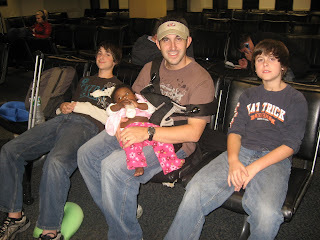 Getting ready to board Aster's first plane ride! Can't you tell she is so excited? 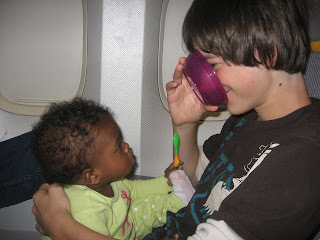 Playing with her big brothers on the plane. She loves the sounds of plastic spoons beating on bowls, and the fact that Joshua's face turns purple when he puts it on his nose. 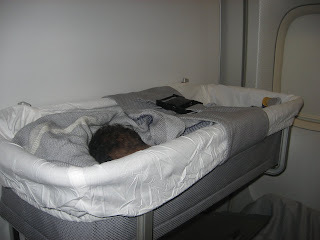 Sleeping in the bassinet in front of our seat. Sweeeet! 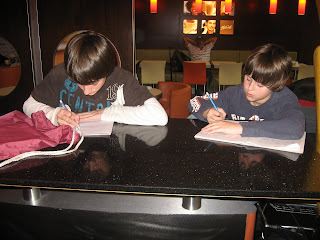 We found a great restaurant with a shopping center all around it at the Frankfurt airport. Eating, shopping, changing diapers, walking around, changing diapers and eating again. What else could we do to pass time in the airport for 6 hours? "Okay, I'm done! Thanks for trying but peek-a-boo isn't even enough to entertain me anymore." "See even daddy is ready for a nap." "Me too! Thank you mommy for being my bed." 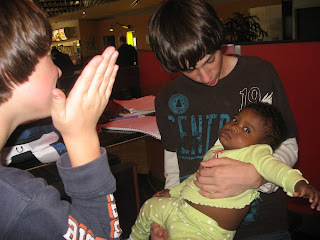 "What are Joshua and Andrew doing? Writing books? Why aren't they tired?" "Oh now I see! When I wake up they go to sleep." "Why is Daddy smiling so big? 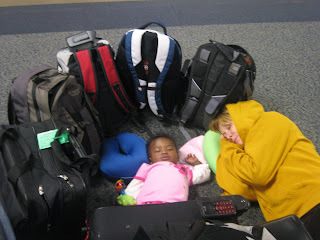 We just missed our flight and I am pooped!" "Okay, well if you play with me maybe I'll smile, too." "Oooh, I like this play pen mommy made for me!" "Oh, it's not only a playpen but a baby bed, too. What's mommy doing in here?" 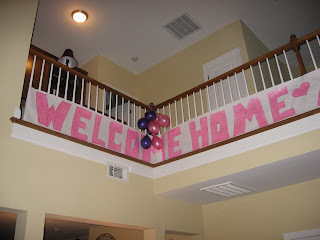 "Who are all these smiling and huggy people with balloons and welcome home signs? Shouldn't they be in bed? It's so late! I guess they are really excited that I am here!" "Hmmm. Who is this? He's really snuggly! They say he's our pastor but I think we could be related!" 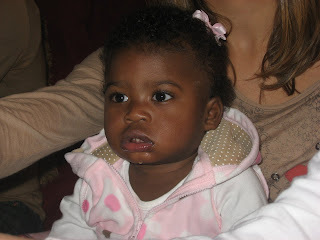 God has done a beautiful work in Aster's heart since we left Ethiopia and headed home. She is SO HAPPY and feeling so secure in our love. She is laughing and playing, making new sounds and being so cuddly! It has truly been a transformation before our very own eyes. 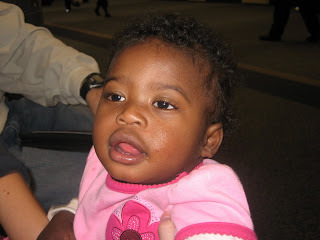 She is already a display of HIS splendor, which is the promises God gave me for her life exactly two years ago today! This is the view outside our hotel room. I've looked at that tall unfinished cement building this week and wondered why it was never completed. 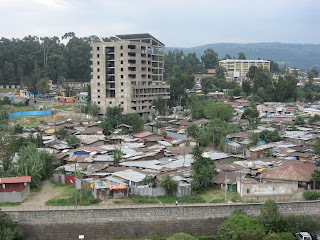 I wonder also about those who live in the homes below and their unfinished dreams. It breaks my heart as we get ready to leave, knowing there are so many more who need our help. But for today, God has asked us to be part of one mother's dream to give her daughter a hope and future with a family who would love her and take care of her in a way she never could. I can't wait to tell you more about her story. UPDATE: Leave: Wash-DC @ Charlotte at 9:50pm which puts us home by midnight we hope! Andrew just asked if we could all pray together. 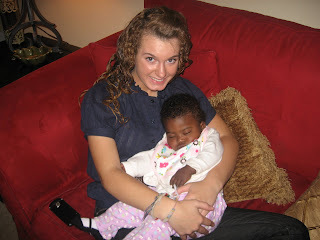 It was so precious! Then when we were done he asked me to email and blog and facebook our friends to ask them to pray. I think he's a little anxious about this very long part of our journey to get home, and he's concerned Aster will be crying. Right now she is sound asleep and hopefully she will be for a while. We'd all treasure your prayers. 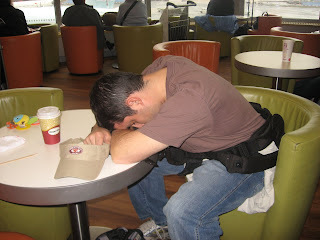 My biggest concern is our 6 hour layover (can't leave the airport because we don't have visas for Germany) so we are praying God will bless us with something really good that helps us pass the time - like sleep, a movie, good food. This has been an amazing and faith stretching yet God revealing week. I can't wait to write and share with you all of the things God did and tell you about all of the people we met. We prayed we would see Jesus in Ethiopia and we definitely did!! !